What is a Google Business Listing and how do you get one? Who will see your listing and where? How can you make your Google Business Listing more effective? What if Google gave you a free listing that helped your company grow? What’s the catch? You might not be aware of it, but Google has started creating free listings for businesses already. If your company has a brick and mortar location and a website, you probably already have such a listing. It appears when local customers search for your business by name or use Google maps, or search for nearby businesses on mobile devices. Google has automated the creation of these listing based on information available on your website. Our time-tested local SEO service helps improve your Google Business Listing’s rankings and attract more potential customers for your company. For the last 5-8 years, Google has been pushing to provide more relevant local information about businesses to its users. The Google Business Listings are placed above organic search results, making them increasingly important for companies that want to reach out to more customers. The good news is that your listing is free. However, your free listing may not be accurate and might not reflect exactly what you do. If left touched, your listing may not show up at all. In contrast, those optimized local listings rank higher and have a better chance of converting potential customers into leads and sales. As the Twin Cities leading national and local SEO company, we want to help you understand how local SEO works and how your free listing can perform even better to help grow your bottom line. What Is a Google Business Listing and Where Does It Appear? The business listings Google creates automatically show up as a neatly designed information box in Google searches on computers and smart phones. When a local customer searches for your actual business name and location, or searches for a business near their location, your listing may appear. It will also appear if the user clicks or taps on your business when it is highlighted on a Google map. Google is focusing sharply on providing localized information in searches. The information in your listing includes your business name, address, phone number, map, hours and photos. If there are Google reviews of your business, a summary of your ratings may also appear, with a link to read reviews. You Should Take Control of Your Google Business Listing! 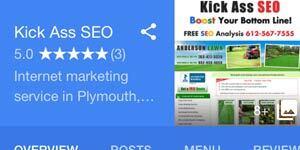 Google has been busy creating these basic local business listings. One probably already exists for your business. To find it, enter your business name and complete address in the Google Search box. On a desktop PC, your listing may appear on the right side of the search results page. Or, you might see your business marked on a small Google map at the top of the results page. Click the mark to view your listing. You need to Claim and Verify your listing. Google will walk you through the claiming and verification process. There’s no charge for this service. It’s a crucial step and lets you take control of what appears in your Google My Business listing. As an alternative, you can ask your web design and SEO company to handle this. That’s a service we can provide for you at NO COST. Business Description – You can add a customized business description to your listing. Only 750 characters or less are available, so this listing should be carefully written for maximum impact. Some limitations apply to this content. Business Photos – Your automated listing will include photos taken from your website or from Google photos associated with your business. You can customize your listing by providing your own photos that tell your story better. Add a video, too, if you wish. Business Posts – These appear temporarily on your listing. They are short posts that can announce special offers, time-limited discounts, seasonal offerings and more. You can include a photo, links to landing pages on your website, or even take orders or bookings. Service Descriptions – If you offer a list of services, you can create a brief description for each of them. As with your business description, the content should be creative and motivate readers to contact you for the services they need. Interact with Customers – Google reviews are gaining in popularity. Your Google My Business dashboard lets you respond to customer reviews. That’s especially important if someone leaves a negative review. A quick response shows readers that you care about customer satisfaction. Monitor Results – In the Insights area of your Google My Business dashboard, you can see graphical representations about your listing’s performance. Use this information to enhance your listing and learn how people are finding your business. As with most internet business activities, active management and optimization of your local listing can take considerable time. One answer is to hire a local search engine optimization firm in the Twin Cities to get the job done right. We can claim and verify your listing for FREE. We can provide additional services to customize the listing to give it a greater impact. We can have our talented professional copywriters create content for descriptions and posts and update that content as needed. We can also monitor your listing for you. We’ll report on performance, notify you of negative reviews that need responses and keep your listing always up-to-date. As Google adds new features or makes changes, we can respond quickly to take advantage of those to improve your listing’s performance. Since the internet first appeared on computer monitors, our team has been helping businesses in the Minneapolis St. Paul area put the power of internet marketing to work. Through user-oriented website design, research-based SEO, AdWords pay-per-click advertising and neuromarketing expertise, we’ve provided our clients with comprehensive service. Our results are proven through increased sales, leads, and increased revenues. As the internet has changed, we’ve not only kept up with those changes, but have anticipated them, giving our clients the competitive edge. At very affordable rates, we’ve already helped many clients maximize the performance of their local SEO. Contact us today and let us show you how we can enhance your search engine marketing success.